CIP’s mission is to extend the life of industrial systems and solutions by up to 10 years. To do this, a lot of testing, testing and more testing has to happen! Codethink helps lead CIP’s Technical Steering Committee and plays an integral role in the technical community. As such, Codethink shares updates and progress reports on an ongoing basis. In this new blog post, Agustin Benito Bethencourt shares what Codethink has been focusing on this year and the results of these efforts. This year, as maintainer, Ben is focused on security as well as supporting the CIP community, providing advice and answering questions about the Linux Kernel and the Debian LTS process. Several versions of the CIP kernel have been released so far in 2018, being the latest one published this past May 18th, version 4.4.130-cip23. A new version of the CIP kernel will be published right before the Open Source Summit Japan 2018 starts. make to the Kernel community. integrate B@D with the new CIP testing infrastructure. upstream changes with heavy impact to the tool. Codethink contributes to CIP in several other areas as well. Agustín Benito will talk about the CIP kernel process at Open Source Summit Japan 2018 and introduce CIP to Open Source developers at the OpenSouthCode in June. Codethink has also contributed to the CIP blog with an article earlier this year and is an active participant at the CIP Technical Steering Committee. 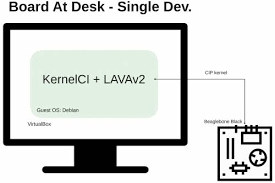 During ELC 2017, CIP project members introduced the beta version of what is being called Board At Desk – Single Developer (B@D), an effort by the CIP testing team to integrate LAVAv2 and KernelCI into a Debian-based virtual machine allowing Kernel hackers and maintainers to test any Linux Kernel on a board directly connected to a laptop. 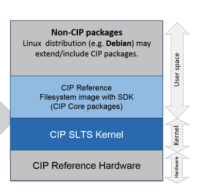 For CIP developers, the focus is the CIP Kernel, based on Linux 4.4 LTS and the reference boards designated by the CIP TSC (Technical Steering Committee). This May 31st 2017 the CIP testing team released the first fully working version of this virtual machine, labelled as B@D v0.9.1. Read about what comes with it and how to use it in the Release Announcement. In this first release the CIP testing team has tried to satisfy the requirements of as many developers as possible who could use B@D. In order to reduce the complexity of setting up the environment to use the tools, Vagrant was the selected technology. VirtualBox has been chosen as the initial virtualisation technology in order to also support the needs of those who use Windows to create Linux systems. We are looking forward to incorporating KVM into the equation as soon as possible, thus improving the experience of those using Linux to produce Linux based systems. 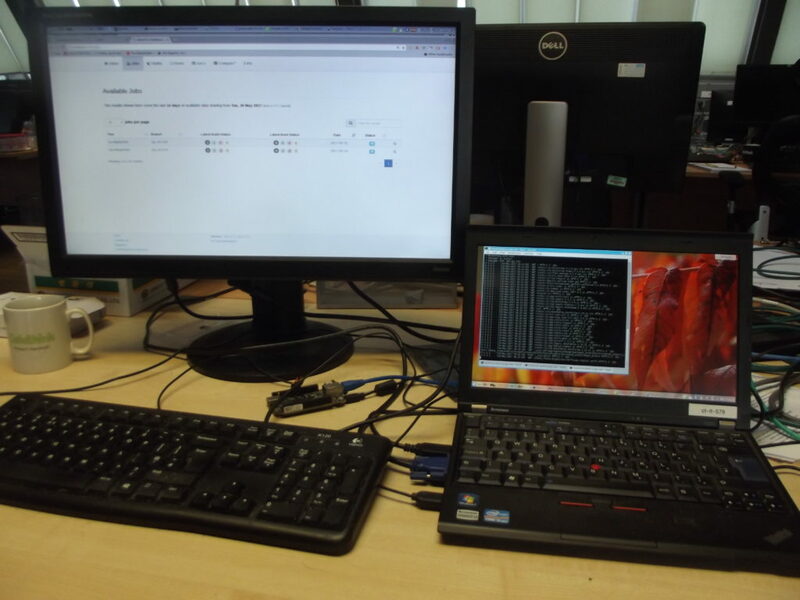 Detailed step by step documentation to deploy and configure B@D, connect to the Beaglebone Black, and test the CIP Kernel is also provided. The CIP testing team has put significant effort into making the toolset easy to deploy and configure so that users can focus on testing rather than worrying too much about the tooling. I would like to publicly thank all developers that have made this release possible, particularly my colleagues at Codethink Don Brown, Robert Marshall, Christos Karamitsos, Ben Hutchings and Lachlan Mackenzie. If you are attending Open Source Summit Japan pass by the CIP booth to see how easy it is to use B@D to test a Kernel in a BeagleBone Black. Renesas is currently working towards making sure B@D also supports Renesas RZ/G1M. There will be additional demos at the CIP booth from Hitachi, Siemens, Toshiba and Plat’Home. CIP is also organising an open Workshop session. You can propose topics for it or simply join us. It will take place at the OSSJ venue the day before the OSSJ starts, that is May 30th. Please check this wiki page if you are interested in attending, proposing topics or contacting. There will also be a talk on Friday 2nd June about the latest CIP news. Now that we have the tool, our next step is to start setting up the CIP testing project following an architecture design that does not rely on a centralised testing service. If we can guarantee that several developers are using the same testing tool to test a specific Kernel feature on a CIP kernel, using the same test in a cloned environment, the resulting output should be identical, which can be confirmed by sharing the results, among other measures. Several assumptions will need to be made like the creation of a similar chain of trust and transparency that any Open Source project has when it comes to code development. Other measures will need to be considered towards reproducibility and traceability of any test result. In summary, we would like to translate the idea of treating testing like coding in an open environment such as CIP. You can read more about it in the CIP testing project landing page. The described approach has a low risk, in my opinion. If we face scalability issues, a centralised service can be created so the investment can be rapidly adapted. But the bigger benefit of this approach will be cost since the required initial investment is limited. The project will grow organically, compared to a centralised testing service, limiting the financial risk too. The current plan is to present some results at ELCE, which will take place in Prague in October 2017.